For the last Historic Rock Ford Plantation Second Sundays event my mother wore her 1790s white floral cotton gown inspired by an original in the collection of the Kyoto Costume Institute. 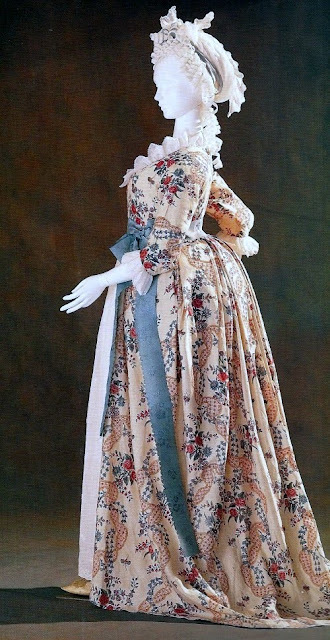 During this transitional time in fashion history dress waistlines were rising and the points that once existed at the center front of bodices were no longer added. Dresses of this style may have been an older dress remade by shortening the bodice and removing the bodice points at the center front and back. The dress could be worn with a matching petticoat or a coordinating sheer cotton petticoat. She wore a pink silk sash tied in a bow at the back and matching pink silk shoes with the dress. A garnet necklace and earring set completed the look. Above: From Revolution in Fashion by the Kyoto Costume Institute. 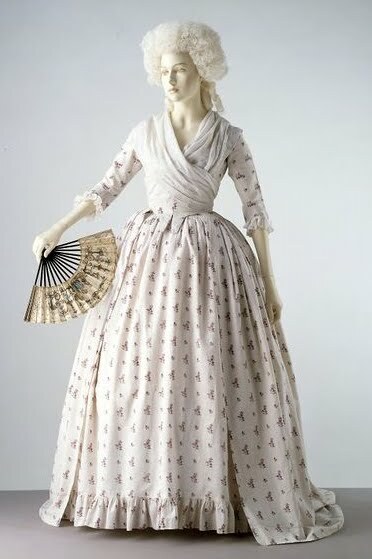 Above: An example of a similar dress with matching petticoat from the 1780s that could have been altered later to look like the Kyoto dress. From the V&A.